The FAMILY WOLLI is now available in English! Fun projects to whizz up on your ADDI EXPRESS machine - this entertaining book gives full instructions for 20 endearing animals. 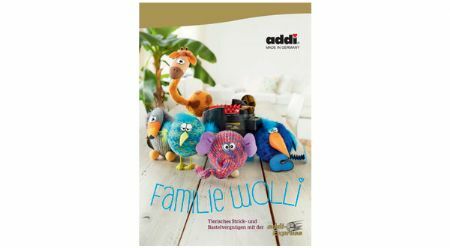 If you are looking for ways to occupy youngsters at home this summer, you will find the Wolli Family a creative way to enjoy a little time - make the knitted toys and read their story...and you do not need to have any great knowledge of knitting to do it. Lots of craft fun for young and old: suitable for age 3-4 years and up.